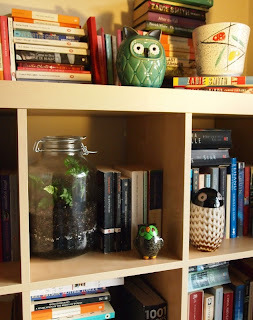 When Emily kindly invited me to write a post about my bookshelf, I realised that I'd need to do a little bit of a clean up. Which meant rounding up all the books that had escaped from their my shelves and return them to their rightful places. So I started hunting. I found a little pile of three books under the coffee table. 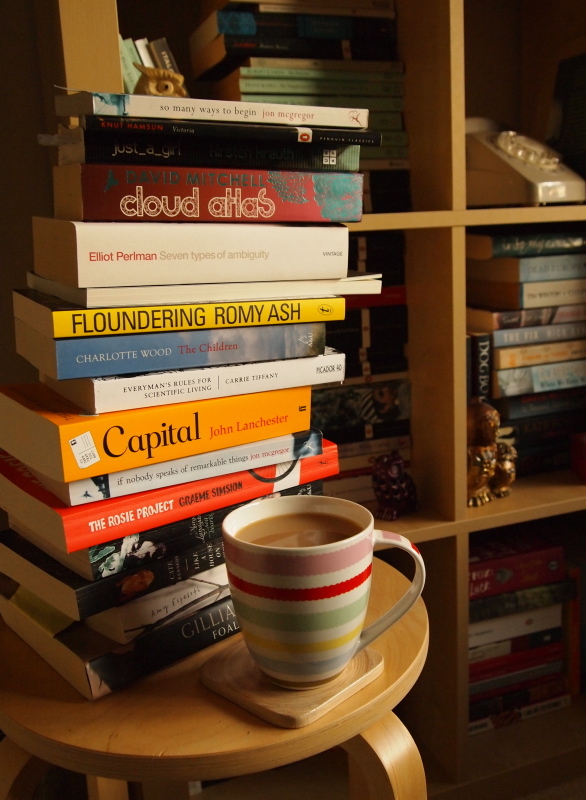 There were a further four books on the coffee table itself. On the dining table, there were at least two, and sitting on the stairs, waiting to be transferred upstairs, there were around six books. The Slap was under the couch, for some reason. That's not all. Outside the door to my study, there's yet another little pile of books. There are more books next to my side of the bed. My desk has a stack of books that I'm currently writing about. In the time it's taken me to write this post, a further four books have materialised on my coffee table. These shelves are a recent addition to my study. 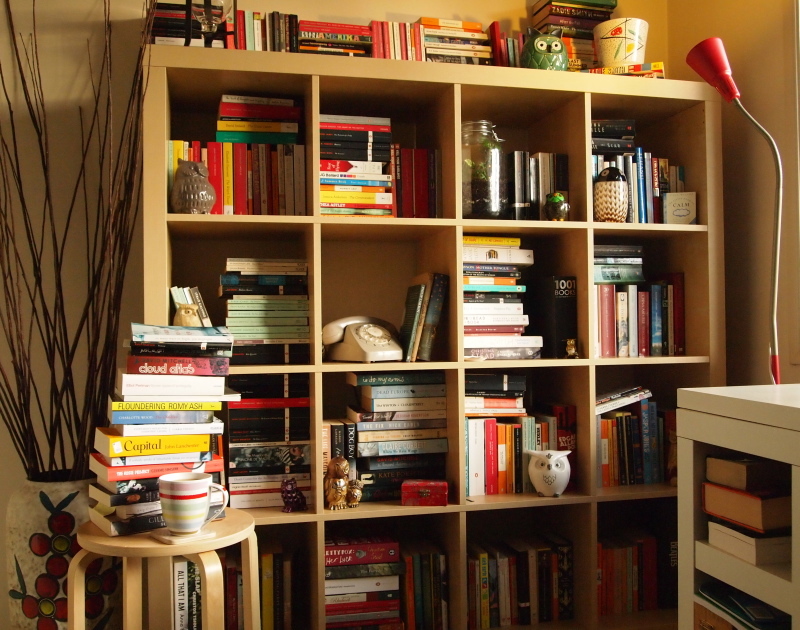 Before that, all my books were piled up in staggering stacks against the wall. They'd frequently topple over, or I'd accidentally bump a pile as I walked past, causing a great literary avalanche. Last year, I got sick of wading through books to get to my desk, got in the car and drove off to Ikea. Only hours later, we'd returned, the shelves had been assembled...and I'd already filled them with books. I'd write something about how my books are organised - but, to tell the truth, there's very little logic behind the way I've decided to shelve my books. 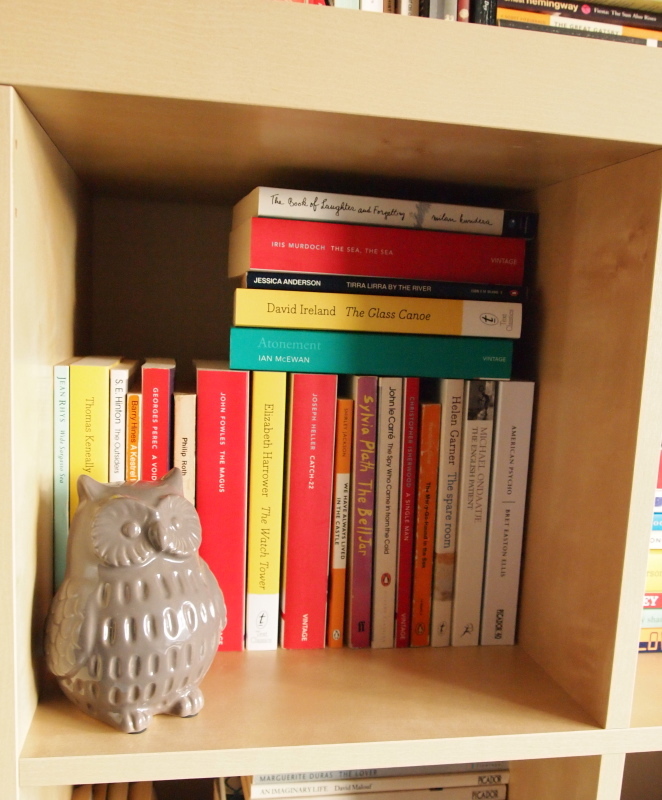 On top of the bookcase are all the books I've blogged about so far. The first couple of cubes contain the books I'll be reviewing soon. And that's about as organised as my shelves get, I'm afraid. Most sensible people have their favourites all grouped together. I've got a few clusters of favourites here and there. You can tell the books I've loved the most at a glance - just look for the creased spines. There are a few little clusters of similar books here and there. Most of my non-fiction is gathered together. I've tried to keep all of my sci-fi and fantasy favourites in the top right corner. Modern books and older books are shelved separately, because sometimes, I decide what to read based on the age of the book. But otherwise, it's all a glorious jumble. The books that are sitting on the little table in front of my shelves are pretty much all unread, waiting for me to find room for them. Which is a problem, because I keep buying more books and I'm already out of room. I'm not going to lie, I own a lot of books I haven't yet read. A lot. But I'm okay with that. I don't see my to-be-read pile as a threat or a curse. To me, unread books are like the voices of friends, calling me out to play. 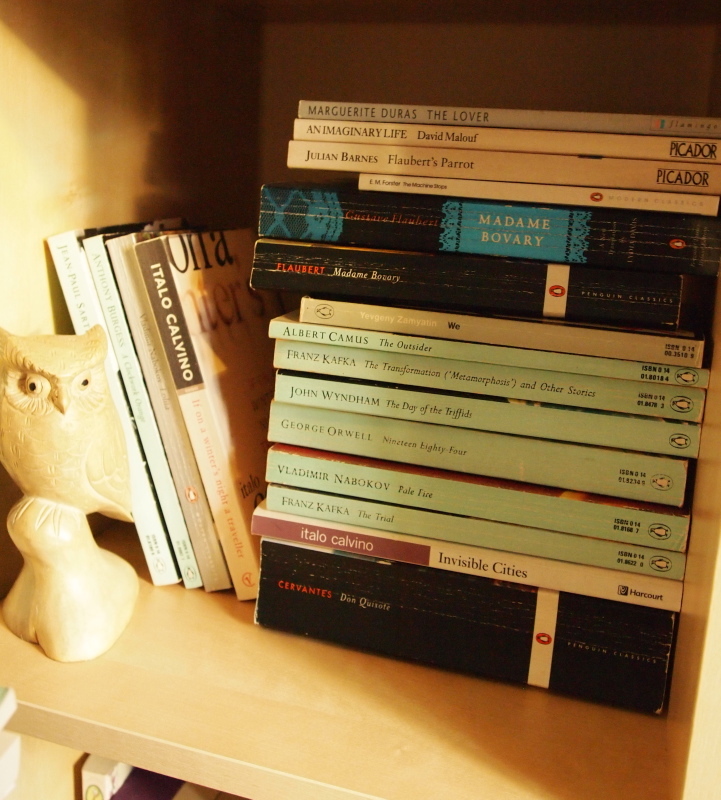 Just seeing them there, sitting on my shelves fills me with delight at the thought of all the literary discoveries waiting for me. The weight of those unread books keeps me from drifting away to other things. I'm grateful they're there. The most treasured book from my collection is my first edition American edition of The Little Prince - one of my favourite books. It was a Christmas gift from my husband a few years ago. It's a fragile thing, so it lives in a special place. I've heard of people who have home cinema rooms. I dream of one day owning a house with a library. Possibly even one with a secret entrance. But until then, I'll stick with my overflowing shelves from Ikea. Michelle has an amazing, time-travelling blog of her own called 'Book to the Future'. She was a finalist in the 2013 Best Australian Blogs Competition run by the Australian Writer's Centre. She is also a bundle of sunshine and I look forward to her blogs and tweets immensely. You should too!